CAMBRIA, N.Y. (WKBW) — A man was hospitalized early Thursday morning after a four-vehicle crash in the town of Cambria. Niagara County sheriff's deputies said the accident happened around 11:30 p.m. Wednesday on Lockport Road. While their investigation is ongoing, deputies said a Ford Explorer first crossed the center line and hit a GMC Suburban. Both vehicles ended up mangled in ditches off the road. A Chevy Traverse then struck the Ford Explorer, and a Saturn hit large debris in the roadway, deputies said. The vehicles were spread out over a quarter-mile stretch of the road, firefighters said. Firefighters also said the driver and apparent lone occupant of the GMC Suburban had to be extricated. That driver, who has not been identified, was then taken by Mercy EMS to ECMC. As for the Ford Explorer, firefighters said it appeared two women were in the vehicle. 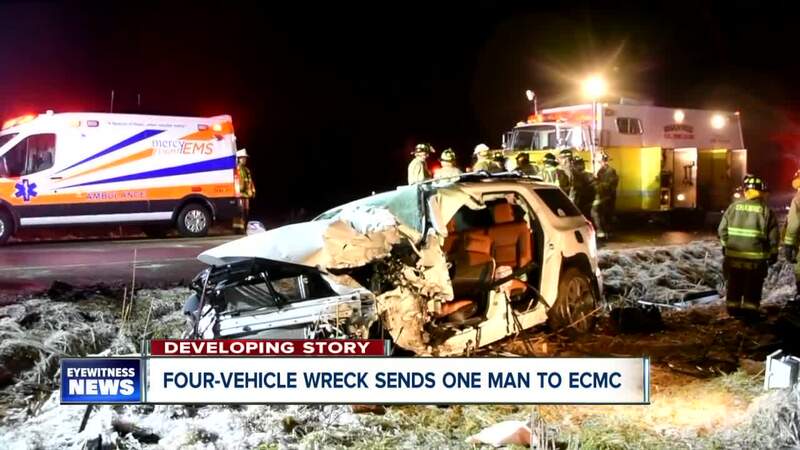 They said the driver signed off on treatment at the scene and the passenger was taken to Niagara Falls Memorial Medical Center with a complaint of neck pain.